Today I am excited to talk to you about papaya, or the fruit of the angels, as Christopher Columbus himself is said to have named it. Papaya, papaw or pawpaw is an extremely rich source of nutrients such as carotene, vitamin C, flavonoids, B vitamins and minerals. Due to its high antioxidant content, papaya is said to increase life expectancy, if consumed regularly. In addition to this, it can significantly reduce the health risks of cigarette smoking and reduce the risk smoking related diseases such as emphysema and lung cancer. Papaya extracts are also used in the cosmetic industry and marketed in anti-aging products as a result of its antioxidant properties. The fruit stands out thanks to its generous content of vitamins A and C, both of which are important for a strong immune system, skin health and good eyesight. It also contains small amounts of potassium, a nutrient of crucial importance for cardiovascular health. Papaya is a good source of folic acid, providing 38 mcg of the vitamin and benefits for pregnant women. With 1.7 g of dietary fiber for every 100 g of fruit, it helps improve transit time and relieve constipation, with benefits for colon health and hemorrhoids. What does papaya look and taste like? Papaya is the fruit of the papaya tree (Carica papaya). Papayas have a slightly elongated shape and bright-yellow or orange flesh, depending on the variety. They look a lot like pear-shaped melons. As it ripens, the fruit changes its skin color from deep green to bright yellow. The seeds are enclosed in a jelly-like substance in the hollow middle of the papaya fruit. Both the flesh of the fruit and its seeds are edible. While the seeds of the fruit are bitter and strong-flavored, the beautiful, brightly colored skin is soft and sweet, with a tropical aroma. Ripe papayas are best eaten raw, in a delicious, fragrant fruit salad or paired with golden onions and grilled chicken. For extra flavor, you can add some hazelnuts, walnuts or even sesame seeds, poppy seeds or sunflower seeds. Unripe papaya contains papain, a special enzyme which breaks down proteins. Similarly, pineapple contains bromelain, an enzyme with a similar function. Good to know: While these enzymatic compounds are not dangerous, they may cause problems for people with various gastrointestinal conditions, notably gastritis and acid reflux disease. As such, anyone with digestive conditions might want to avoid papaya, pineapple and citrus fruits (see what foods to eat and to avoid for gastritis). It has been reported that eating small quantities of green papaya after a heavy meal can help the stomach digest proteins more easily. Due to its papain content, the fruit can be used as a natural remedy for slow digestion. The unripe fruit further makes an excellent tenderizer in marinades. And remember: papain is found in the neck of the fruit for the most part, as well as in the latex obtained from the papaya tree, but the whole fruit contains small amounts throughout. In pregnancy, papaya comes with restrictions. 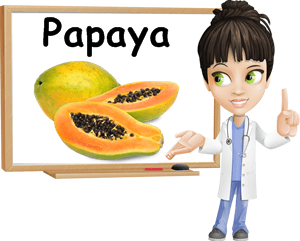 Pregnant women should avoid eating papaya in large quantities and avoid the unripe fruit altogether. Green papaya can cause uterine contractions that may lead to a miscarriage. Actually, the unripe fruit was traditionally used as a method of inducing abortion and even as a natural contraceptive. Special compounds found in green papaya and papaya seeds are believed to have potent contraceptive effects and may act similar to modern contraceptive pills, suppressing the action of certain hormones. Pregnant women should also avoid eating any unripe fruit for the same reasons (see article unripe vs ripe fruit: nutritional differences). Ripe papayas are a great source of carotenoids. Both the bright yellow and orange flesh of the fruit provide important amounts of lutein and zeaxanthin, vitamin A precursors with potent antioxidant effects. Both lutein and zeaxanthin protect the human retina from free radicals found in light waves and promote visual acuity. The fruit is also a source of beta-carotene which is further converted into vitamin A. All three vitamin A precursors found in ripe papaya help prevent macular degeneration associated with old age. Macular degeneration is the partial of total loss of central vision caused by retina damage. As vitamin A precursors, the carotenoids promote skin health and have immune-boosting properties. Because of their antioxidant action, the pro-vitamin A carotenoids are believed to play an important part in the prevention of cancer. According to a study conducted at Kansas State University, papaya can increase the life expectancy of smokers as well as passive smokers. Professor Richard Baybutt studied the relationship between vitamin A, lung inflammation and emphysema and made a surprising discovery: benzo(a)pyrene, a common carcinogen found in cigarette smoke, causes vitamin A deficiency in both first-hand smokers and in second-hand smokers. Vitamin A appears to have a powerful protective effect on the lungs and this may help explain why some smokers never develop emphysema, a progressive lung diseases that causes difficult breathing. There are people who take up smoking from a very early age and live to be 90 years old. Why? The answer might be that, for some people, a diet rich in vitamin A can prevent smoking-related diseases. If you smoke or are exposed to cigarette smoke, make sure your diet supplies you with sufficient vitamin A, which will lower the risk of developing dangerous smoking-related diseases such as emphysema and lung cancer. This applies if you work with coal tar as well, because benzo(a)pyrene can be found in coal tar as well. At the same time, experts recommend smokers avoid taking vitamin A supplements. Some studies suggest supplementation with the nutrient can actually increase the risk of lung cancer. Currently, there is no method of determining the effect of vitamin A supplementation on lung cancer risks in smokers. Aside from this, a healthy and balanced diet should include plenty of vitamin A-rich foods such as red chili peppers, spinach, cabbage, carrots, sweet potatoes, cantaloupe, mango, papaya and red bell peppers. 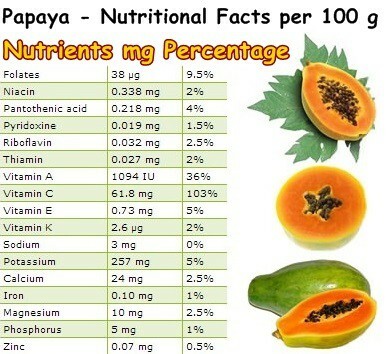 Most of these fruit and vegetables, papaya included, are available all year round in most countries all over the world. Papayas boast even more health benefits: for instance,100 g of fresh fruit provides 61.8 mg of vitamin C out of the 90 mg current recommended daily intake. Among other things, vitamin C promotes the production of collagen, a structural protein which combats wrinkles and keeps us looking young and beautiful. In addition to this, a regular consumption of vitamin C-rich papaya can strengthen our immune system naturally and ensure it responds better and quicker to infection and disease. The fruit is believed to have antimicrobial properties from a naturally-occurring compound it synthesizes itself. What is interesting is that both the papaya fruit and its leaves are used as a traditional treatment against malaria (and other fever-causing infections). Though the mechanism is not very clear yet, papaya is believed to stimulate the immune system by raising thrombocyte levels in the blood. Lastly, the fiber and especially pectin content of the fruit contributes to its digestive benefits, helping relieve constipation and manage hemorrhoids symptoms (see article on foods to eat and to avoid for hemorrhoids). Papaya can be eaten fresh, added to stews or made into jams. In traditional Asian cuisine, the leaves and the flowers are also used for cooking and make savory dishes such as steamed papaya leaves or deep fried papaya flowers. The seeds of the fruit are also edible and boast great health benefits themselves. Because they have a strong, spicy flavor, you can grind papaya seeds and use them as a replacement for pepper. Overall, the fruit appears to have many positive effects on human health and consumption is encouraged. If you feel eating the fruit alone may be a bit dull, you can always mix it with other fruits of your liking and add some cashews or hazelnuts for a crunchier texture. Additionally, you can make a delicious papaya and carrot juice which is sure to be a hit. Just remember that pregnant women should avoid the unripe fruit as well as eat papaya in small amounts and so should anyone with gastritis or acid reflux disease.